Rosetta's navigation camera took this four-image mosaic from a distance of 17.6 miles (28.4 km) from the center of Comet 67P/Churyumov-Gerasimenko on Jan. 16, 2015. It's craggy, powdery, mysterious, and even holds the building blocks of life. Scientists are now getting an up-close-and-personal view of a comet flying through deep space, thanks to Europe's Rosetta spacecraft. The European Space Agency's Rosetta mission has now found that Comet 67P/Churyumov–Gerasimenko's is even stranger than initially expected. A series of new findings beamed back to Earth by the spacecraft since its arrival at the comet in 2014 could help scientists learn more about how comets evolved through time. "Comets appear to be quite different compared one to the other," Rotundi told Space.com via email. "This comet confirms that we would be wrong speaking only of dirty snowballs." When Europe's Philae probe landed Comet 67P on Nov. 12, 2014, it bounced off with nearly enough force to drift away into space. See how the epic comet landing by Philae and Europe's Rosetta mission nearly failed in this Space.com infographic. Scientists have now analyzed various features on the comet's surface to see what the ancient, icy body has experienced in its lifetime. Comets are thought to be leftovers from the dawn of the solar system, so learning more about them could help piece together the history of the planets and other solar system bodies. "Comets have always surprised humanity," Murthy Gudipati, a University of Maryland scientist and Rosetta team member, said in a statement. "[Comet 67P] C-G seems to be no exception." 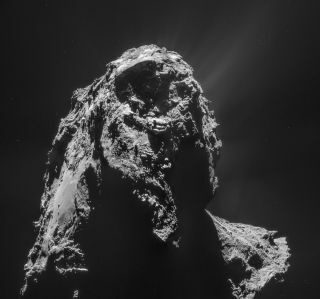 Researchers working with Rosetta have found that the comet harbors organic compounds, carbon-based molecules that are sometimes known as the chemical building blocks of life. This marks the first time organic molecules have been detected on the surface of a comet's nucleus, according to Fabrizio Capaccioni, the principal investigator of the VIRTIS instrument on Rosetta. The northern hemisphere of the comet's nucleus is also filled with dunes and ripples that look somewhat like geological markings on Earth, Mars and Venus. Comet 67P/C-G doesn't have a robust atmosphere and high gravity like those planets, and yet it still has structures resembling sand dunes, according to Nicolas Thomas, the co-investigator of the OSIRIS imaging instrument on Rosetta. So how is that possible? While the data isn't crystal clear, Thomas does have a theory. He thinks it's possible that the comet's outgassing in the active region on the comet could cause the odd surface features. The high-speed gas flows from the regions, expanding into the vacuum of space, and potentially creating the features, according to Thomas. This close-up view of Comet 67P/Churyumov–Gerasimenko shows its diverse surface features. If a person were to stand on the surface of the comet, he or she could jump very high into space because of Comet 67P/C-G's low gravity. The composition of the comet is also very diverse, according to Holger Sierks, the principal investigator of OSIRIS. "You might sink in into the smooth dust where we find the thick snow-field like layers, other areas might be robust enough to carry you," Sierks told Space.com via email. "The dust is dry like power." Another study in Science this week also details new research about the temperature of the comet. Lead author of the study Samuel Gulkis of the Jet Propulsion Laboratory and his team found that the northern hemisphere of the comet is relatively warm, while the southern hemisphere is somewhat colder, indicating seasonal changes on Comet 67P/C-G.
Rosetta's findings have also potentially upturned a theory about how water was delivered to the early Earth. Many scientists think that comets brought Earth its water; however, the type of water found in Comet 67P/C-G is so different from terrestrial water that some researchers are starting to second-guess that claim, opting instead to look at asteroids as the objects that delivered water to Earth at first. Scientists working with the European Space Agency's Rosetta mission have found that Comet 67P/Churyumov–Gerasimenko is darker than charcoal. It is compared to Earth and the moon in this image released on Jan. 22, 2015. Rosetta has also been studying the atmosphere (coma) around the comet's nucleus. The probe has detected dust grains orbiting the comet, and scientists are hoping to learn more about how they form and why they remain in the comet's orbit. As the comet gets closer to the sun and more dust is released from the cosmic body, it's possible that the Rosetta team will have more opportunities to learn about the dust-to-gas ratio of the comet, Rotundi said. Researchers working with the program aren't yet sure if the comet is what's known as a contact binary — two lumps of different cosmic bodies stuck together. Comet 67P/C-G appears to be dehydrated on its sunlit side, according to Thomas, but as the sun starts to hit the southern hemisphere of the comet it's possible that that side of the comet will begin to become active and heat up. The shifting sunlight could give the team a chance to understand more about the comet's origins. "I want to see erosion of the weakly consolidated material and want to see something collapse. And I want to see a ripple move," Thomas told Space.com via email. "Also, the sun is slowly moving towards the southern hemisphere and who knows what we will find there. The action is just starting so I'm confident that we are going to have some fun." It's even possible that Rosetta's Philae comet lander, which is currently on the surface of the comet, might wake up and start beaming back data as the comet heats up during its lap around the sun this year.